“I can easily roll it” “Love the guitar storage rack. My room doubles as a pe locker room and I am able to easily turn the cart around and make it less accessible to those visiting teams. I really love my classroom for guitar, but sharing it with visiting teams does make me a little nervous. The guitar storage cart was the perfect answer to those worries. If I think I will have a real rowdy bunch, I can easily roll it across the Commons to the music room. Thanks for a great, affordable product. 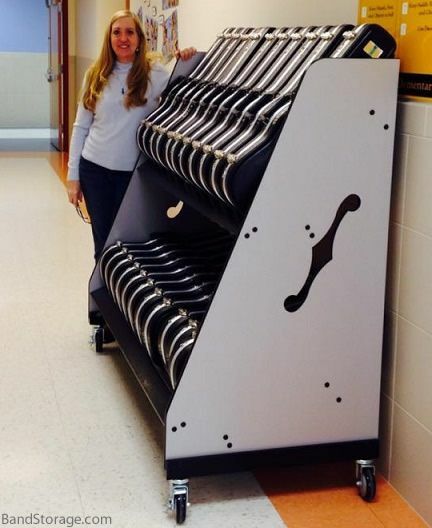 I will try to remember to snap a picture of it in my classroom.” – Shelly G.
“It’s light, yet sturdy” “Perfect rack for my school. I teach guitar and all band instruments in lessons in this room… It’s light, yet sturdy. Has good wheels for sturdy, fast mobility. The pegs allow you to store guitars in or out of cases. Works well for some keyboards too. Thanks for an easy to assemble product that is very functional.” – Shelly G.